One of the priorities for the CanAssist African Relief Trust is to attempt to help young Africans have opportunity to learn and study so they can become better educated and thereby better able to help Africa develop. Nyanza Province is one of the poorest regions of Kenya and many schools, both public and private, are crowded, neglected and underfunded. This Secondary School classroom is at the Kamser Mixed Secondary School in Rachuonyo District near Homa Bay, Kenya. There are 187 students at this school and they lack sufficient numbers of desks for students to study. This is a classroom at the Kamser Primary School. 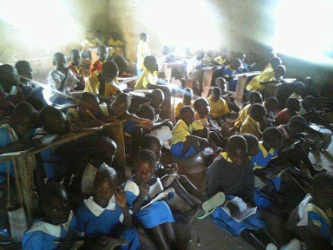 Their classrooms are in poor repair and they also need new desks for many of the 352 children that attend the school. St John's Academy is a nearby privately run elementary school with 168 children enrolled. Classrooms are made of iron sheeting, much of which is becoming rusted. They also lack sufficient desks for all the students. CanAssist will start to help these schools by funding construction of 70 desks for the Kamser Primary School. The desks will be used in two new classrooms that are currently unfurnished and will accommodate about 200 students (3 per desk unit). The desks will be made by local carpenters. This means that not only will the CanAssist gift provide desks for the students, it will give some local tradesmen work. The cost for construction of the desk units is 2400 Kenyan Shillings (approximately $30) per bench desk. 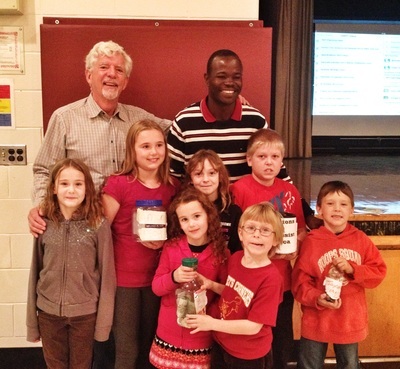 CanAssist has already received money from fundraising done by students at Sweet's Corner's School near Lyndhurst, Ontario and the Inglewood Elementary School in Scarborough. We hope that other Canadian students will join the drive to raise the funds to provide desks for their peers in Rachuonyo District. 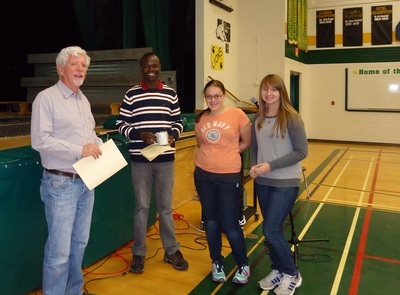 John Geddes and Dan Otieno (Kenya) receive donations toward the Rachuonyo desk project at Sweet's Corner's School.